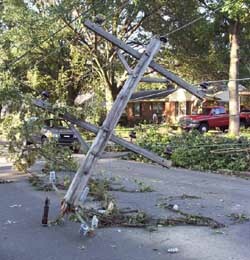 On July 22, 2003, a thunderstorm rolled through Memphis with sustained straight-line winds between 60MPH and 100MPH. In less than half an hour, 338,000 of the sity's 450,000 utility customers -- homes and businesses -- lost power. Thousands of trees were blown down, many into houses and other buildings, over 1,000 utility poles were damaged or destroyed, hundreds of traffic lights were damaged (some literally torn to pieces and strewn across the ground), and the entire area ground to a halt. It took Memphis Light, Gas, and Water and over a thousand out-of-town electrical workers sixteen days to restore power city-wide. Our house was without power for ten and a half days; our lights went out at 7:00 AM Tuesday morning and didn't come back on until 7:45 PM on Friday, August 1, a week and a half later. The last customers got power back the following Thursday, August 7. I took a few pictures during the outage, which can be seen below. There is also a large collection of pictures online here at the Commercial Appeal. The day the storm hit, I turned right onto a street just around the corner from the house and discovered a string of fallen trees tangled in power lines and snapped power poles. While we were cooking potatoes on the grille for dinner that night, we walked over and took a few pictures. A couple of pictures of the backyard, taken on the 23rd, give a little idea of the lighter debris that fell all over the city. My office was without power for about two days, and a large tree in our parking lot fell across one entrance into the lot. Under normal circumstances, it would have been an impressive tree-fall. Instead, it's more of a typical case. A neighbor with a generator loaned us a bit of power so we could get a fan running when the typical summer heat returned the weekend after the storm.